Nano LED lighting and Cinema 3D technology are among the selling points for the new high-end set. Havis Kwon, president of LG Electronics, is a big fan of the new 9800 series. "We've set a new benchmark in connectivity, picture quality and sheer viewing enjoyment," he says, calling the LW980S "the crown jewel of TVs." The 9800 line boast smart TV and connected TV features, but there aren't any specifics yet on just what those entail. It handles 3D as well, using passive technology rather than the active technology that most manufacturers are using. This gives you lighter glasses and, according to LG, an absence of crosstalk and flickering. 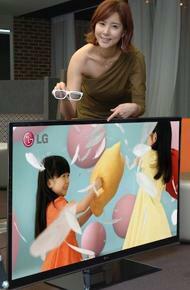 LG's 9800 doesn't just play 3D video - it can change over a 2D signal to 3D as well. The quality of that automatic conversion is yet to be seen, but being able to transition is nice either way. One of the big selling points of the 9800 is the Nano Full LED backlighting technology, which spreads out the light evenly across the screen. Local dimming in the 980S is done in 2,300 individual segments. LG will be showing these sets for the first time publicly in September at IFA Berlin. Hopefully we'll find out more details then.